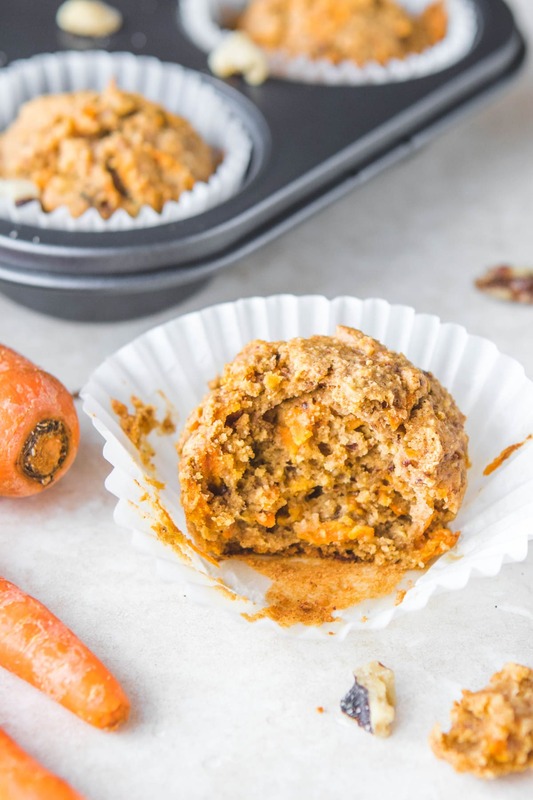 These One Bowl Vegan Carrot Cake Muffins are perfect for an easy on-the-go breakfast! They’re also Gluten Free, Oil Free, and Refined Sugar-Free. 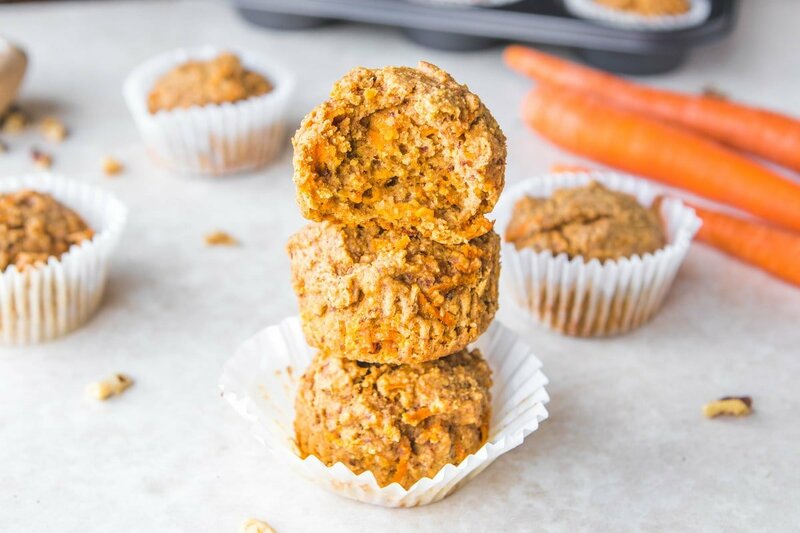 These Vegan Carrot Cake Muffins are subtly sweet, perfectly spiced, and a healthier version of a classic dessert. Heck, considering these are made with wholesome ingredients and no refined sugars, I’d say they’re perfect for any time of day. 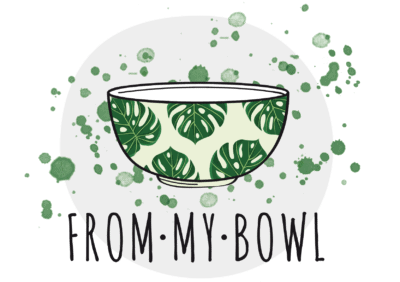 Plus, you only need one bowl to make them! Also, most Carrot Cake is usually loaded with Sugar and Butter. However, I decided to take a different route with these muffins. They’re subtly sweet, thanks to some Maple Syrup and the natural sweetness from the Carrots themselves. Plus, I used Almond Butter instead of oils to make them moist (in a good way) and flavorful! This recipe makes 12 regular sized muffins, but if you would like them to be larger or “bakery style”, it will make 8 instead. 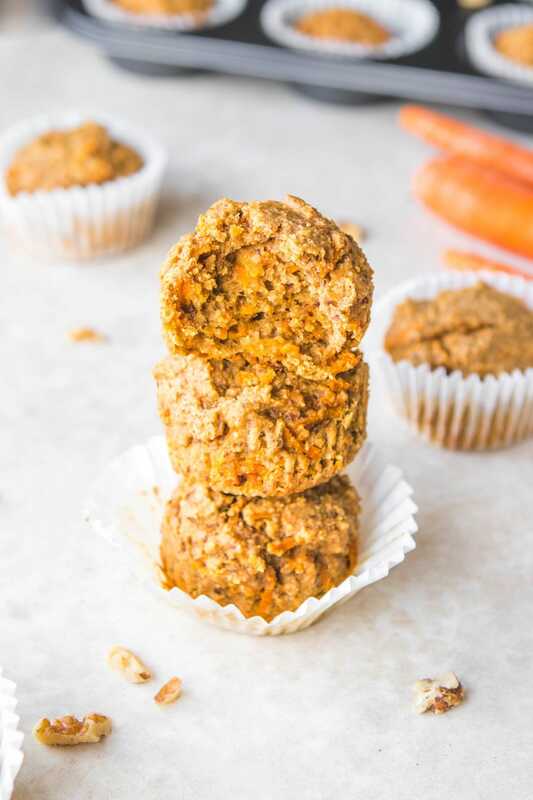 Some Carrot Cake contains Raisins, but I know how some people feel about those 😉 If you are a fan, you can fold in 1/3 cup with the shredded Carrot. If you’re looking for more healthy baked goods, you’ll also love this Fluffy Vegan Banana Bread and these Salted Caramel Apple Breakfast Bars! 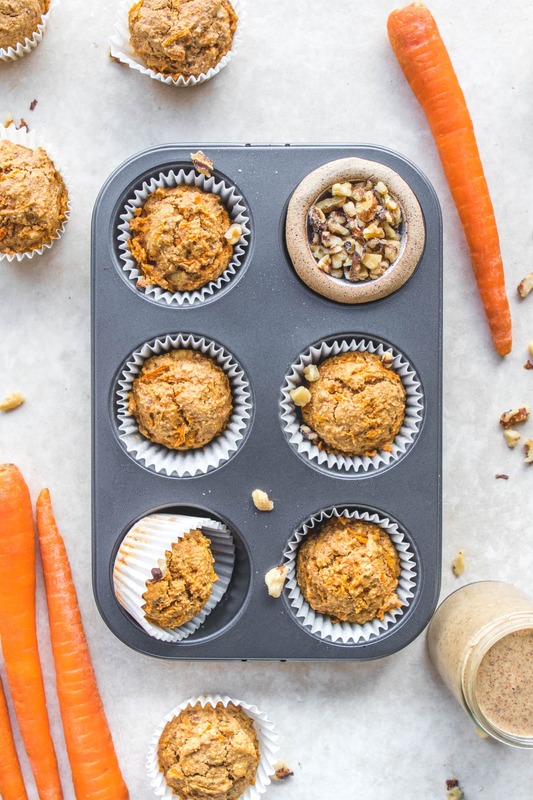 These Vegan Carrot Cake Muffins are perfect for an easy on-the-go breakfast! They’re also Gluten Free, Oil Free, and Refined Sugar-Free. First, preheat the oven to 350F. Combine the Ground Flax and Water in a small bowl, stir, and set aside for 5 minutes to thicken. Add all of the Flours, Baking Powder, Cinnamon, and Salt to a bowl. Mix well, and form a “well” in the center of the dry ingredients. Pour the Flax Egg, Maple Syrup, Almond Butter, Plant Milk, and Vanilla Extract into the center of the well. Mix these ingredients together, and slowly incorporate the dry mix into the wet, until a thick batter forms. Next, fold in the shredded Carrot and Walnuts until they are evenly distributed throughout the batter. Divide the batter evenly into a greased or lined muffin tray – this will make 12 normal sized muffins or 8 jumbo muffins. Bake for 25 minutes, or until the tops are golden and a toothpick comes out cleanly. Store at room temperature for up to 4 days, the fridge for up to 7, or the freezer for one month. I have not tested this recipe with any other flour combination, and thus do not recommend substitutions – try at your own risk! Almond Butter may be substituted for another Nut or Seed Butter of choice – just keep in mind that this will affect the final flavor. Crunchy Asian Slaw Recipe | Quick & Tasty! This looks so good! I was wondering, do you think it would work to use just a combination of the almond flour and oat flour and not use brown rice flour, if you don’t have it on hand? And would it affect the texture if I used just 1/4 cup of maple syrup instead of 1/2 cup, to cut down a little on the sugar content? 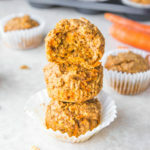 These look so good, and I <3 carrot cake ! Hi Marie, please see the notes for my flour recommendations. Also, I would not recommend reducing the maple syrup, as the liquid ratios need to remain the same. Oats are naturally gluten free but are generally not considered as such as cross contamination is an issue. Hi, love this recipe but i am not gluten free and was wondering if this recipe would work with regular all purpose flour? It might be a little more dense with all purpose flour, but should still work. As I said in the recipe notes, I can only recommend the blend that I have tested for this! Loved these I used peanut butter instead of almond butter and also sub rice flour for all purpose flour. They came out great I think next time I might add applesauce to make them a little less thick. is there any way to view the nutritional information? Caitlin, just made these with whole wheat flour and tahini instead of the almond flour + brown rice flour and almond butter. It definitely is denser. The tahini I don’t think was as successful but nevertheless I have breakfast for the rest of the week 🙂 Awesome recipe, I’ve been craving carrot cake lately and this definitely helped! I made this recipe, and they turned out soooo good!! Thank you so much for your wonderful recipes. I made this recipe as is and they were great, but too sweet for my tastes. I’ve made the recipe three more times, but I made them into waffles. It has been so hot out so I did not want to turn on my oven. The first time I used 1/4 cup maple syrup and 1/4 cup applesauce. It was really great that way, but still sweet. The next time I used 2 T. maple syrup and the rest applesauce. The third time I replaced the maple syrup with applesauce completely. I also add more milk to give the batter a slightly thinner consistency. I really liked all the versions I made. And I highly recommend turning muffin recipes into waffles when it’s hot out. Thank you for creating this recipe. It’s one of my favorites! 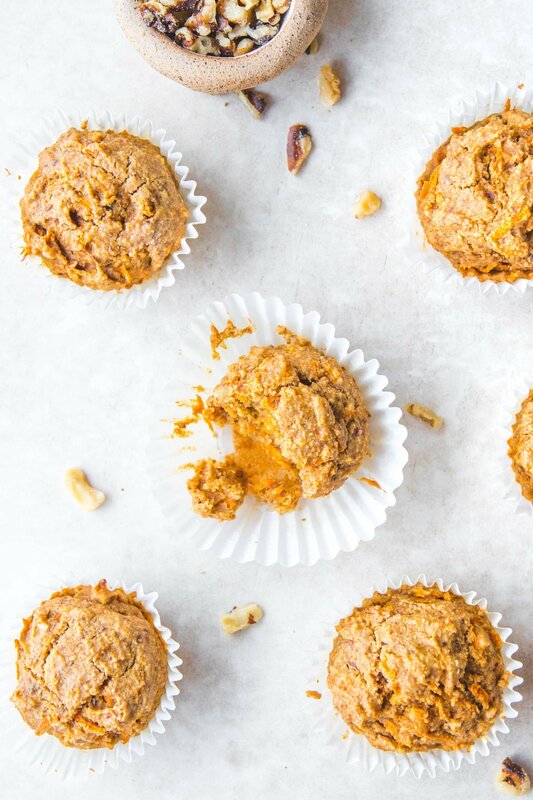 I make different kinds of healthy muffins all the time and these are the best consistency. I did make substantial changes though – I used whole wheat flour instead of rice flour, and applesauce instead of maple syrup. They are soooooo moist and not too sweet!